Large house, very bright and quiet. The apartment is located a few steps from the metro 1. The apartment is a historic residence of a Bourbon minister and there are still the original floors from the end of the 18th century. It is composed of three bedrooms - two double and one with two single beds, a large kitchen, a living room with a double sofa bed, two bathrooms. The host will be happy to give you advice on places to visit and organize personalized tours for you. The apartment enjoys a beautiful view of Mount Vesuvius and glimpses of the sea. It is located in a very quiet typical Neapolitan alley. The high ceilings, the fireplace and the panoramic view make the house very warm and welcoming. Very quiet and in a very quiet environment even for those returning late at night. Shops and transport links within walking distance. Historic center and Vomero within easy walking distance. The archaeological museum (among the most prestigious in the world) is a 10 minute walk from the apartment. All services at your fingertips. For those who reach the apartment by car I suggest you let me know so that you can book a private garage for a fee. It is 6/7 minutes walk and costs between € 20 and € 30, per day depending on the size of the car. Spacious, bright, comfortable apartment with an excellent view. The apartment was situated on the top level of a residential block which enabled an excellent view of Mount Vesuvius from the kitchen window and let the apartment be flooded with light throughout the day. The ample space, seating and bedrooms made this a great apartment for our family group of 8. We particularly loved the sofa in the kitchen as it became a social space for us too, when preparing our family meals and playing our party games. Our host Gabriella was there to welcome us on Christmas Eve when we arrived after 9 p.m. . Not only did she explain the necessities required to support our stay Gabriella had also purchased on our behalf a list of supplies we requested to sustain us for a couple of days as she had informed us the supermarkets would be closed. Local information and a map was also provided to aid our stay and we knew that no question would be left unanswered or request too great if required. If we are lucky enough to return to Naples again we will make sure we book Gabriella's Home and would highly recommend her apartment to friends, family and anyone looking for a home away from home. Gabriella is the best host I've ever had. She was so kind trying to meet up with us eventhough we were having a hard time securing a time but she was waiting for us and made it so easy. The rental is a huge house with a kitchen, living room, multiple bedrooms and bathrooms and a beautiful view of the city. We went all over Europe for a month staying in airbnbs and this was hands down the best. 10/10 recommend this to anyone staying in Naples. Gabriella also showed us all the places to go around Naples and the rental has beautiful pictures of the city and surrounding attractions. Great location, amazing host, and clean beautiful place to stay. Dana and her friend have been friendly respecful and nice girls. I defintly recomend to have them as guests. They left the house clean and tidy. I Hope To have them as my guests again. 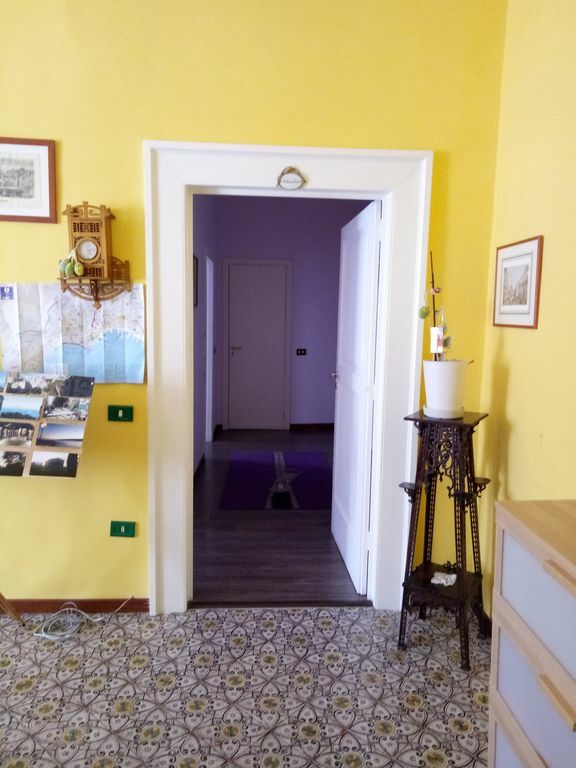 THE HOUSE IS 10 MINUTES WALKING TO THE CENTRO STORICO. FROM THE APARTMENT YOU ENJOY A WONDERFUL VIEW OF THE VESUVIUS AND THE CITY. ALL PUBLIC MEANS - BUS AND METRO - ARE A FEW STEPS. QUIET AND SILENT AREA. OUT OF THE CAOS OF THE CENTER BUT EASILY REACHABLE ON FOOT OR WITH PUBLIC TRANSPORT. THE HOUSE IS VERY LARGE AND ALSO NUMEROUS GROUPS WILL HAVE ITS PRIVACY AND ITS SPACES.